Will The Rebound Continue As We Exit October 2014? After a horrendous bleed out, KLCI is showing signs of rebound, as slew of good earning reports from the US has been giving a positive boost to both DJIA & KLCI. 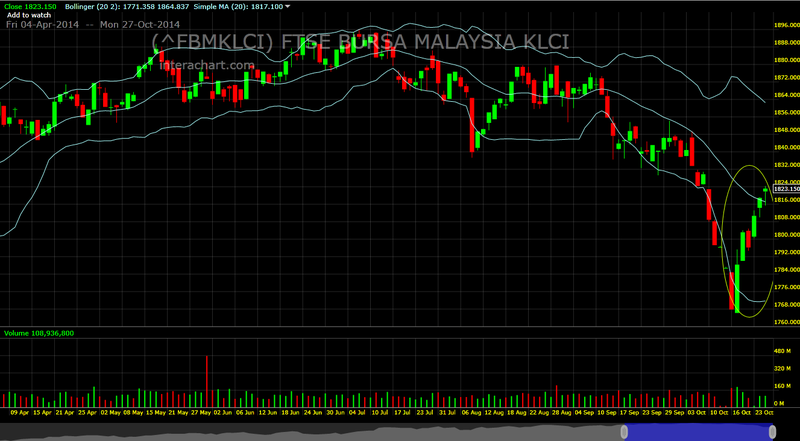 KLCI's pattern is uncanny to the Standard & Poor ETF (SPY). Hence, our overall market trend is correlating to US markets, even though alot of people says otherwise. Malaysia Boleh! Today the KLCI is hitting the midband of the bollinger band, and looks like a crucial moment as today most stocks is losing their steam from the reversal from bottom. The midband will either be a boost upwards or a bounce back to downtrend. We are not yet out of the woods yet.